One or more royalties contract will be awarded. Luxy was established in 1976 as a small producer of chairs in outsourcing, in one of the most important productive areas of Europe, Italy’s northeast. Luxy developed into a highly specialised company in the production of ergonomic and design chairs and sofas. Collaboration with designers like Massimiliano and Doriana Fuksas, Stefano Getzel, Favaretto & Partner and Mario Ruiz, along with the company’s innate vocation for research, experimentation and innovation, accompanied by vast technological know-how and experience, led the company to patent products that were characterised by design and ergonomics that are the symbol of “Made in Italy” products, which are exported to over forty countries, through a network of professionals who are attentive to our customers’ needs. With the entry into equity package of HAT Holding SpA (Hat Holding All Together) that has invested with all the company management, Luxy has had a breakthrough for a further incentive in the development of the company on markets always paying particular attention to the environment and to the regulations for security and compliance. The company is well rooted in the world market, but is in continuous movement to satisfy the demands of its clientele... this is Luxy. www.hat.it 1st June Luxy has celebrated its first forty years from the date of its foundation. Luxy relies on your talent for the design of a new upholstered chair for indoor use, with a modern and refined style, specifically conceived for the contract and residential sectors. Product typology: you are invited to propose the design for an upholstered chair for indoor use, comfortable, with a modern style and apt for various contexts of use. Accordingly, the versatility of the chair will be of the utmost interest, opening up the possibility to employ different types of legs. Where to use: the chair researched by Luxy shall be conceived for indoor use and will address the contract sector, including hotels, waiting rooms, offices, common areas, etc. in addition to the residential sector. Shape and functions: your chair shall have a refined and modern design; the possibility of stacking the chairs is welcomed but not fundamental. Materials: the chair you propose will employ internal structures made of metal and/or wood. The lining might be realised in fabric and/or leather, with the possibility to choose from the various options already offered in the Luxy catalogue (see Material files) or, at your discretion, you may also suggest new solutions and materials. If your design implies the employment of an outer shell, you are not allowed to use plastics or wood for it, as there are already other chairs in the catalogue with these features (see for ex. Prima or Epoca and other products on www.luxy.com ). Production technologies: the upholstery of the chair will be realised through cold-foamed polyurethane and it will be covered as explained in the preceding paragraph. Size and weight: the size of your upholstered chair shall comply with the standard adopted for this product typology. There are no constraints regarding the weight of the chair, but you are nevertheless invited to consider that it shall be handy enough for transportability and stacking. Style and colours: your upholstered chair shall have a modern and very refined design, paying particular attention to the brand style and compliance. For more indications about the Luxy style and current catalogue, you are invited to have a look at their website available at: http://luxy.com/prodotti In particular, you are invited to look at the Meraviglia, Epoca and Prima chairs, that your chairs shall NOT directly compete with in terms of aesthetics. The customisation of the chair will be possible thanks to the ample range of colours available in the 450 fabrics and/or leather options offered by the Luxy catalogue (see Material files ). Proposals offering a meaningful degree of customisation will be of the greatest interest. The legs and armrests can be customised and/or covered with different colours and materials (metal, wood, leather and/or fabrics), as per the Luxy catalogue. Logo: the Luxy logo will be applied on a tag sewn along the lining of the chair. Target: the Luxy chair will mainly address consumers with a medium-high/high purchasing power, presenting itself as a product with a great aesthetic value. The approximate production cost for the chair will be between €80 and €130. Values to convey: you chair shall comply with the Luxy values and identity, be perceived as a product with a great aesthetic value, with a particular care for style and design, able to emotionally involve the consumer. Participation is free of charge and open to designers and creative talents of any nationality aged 18 years or older. Participants can present one or more projects, but only the projects published on the www.desall.com web site, via the upload page related to “Luxy Chair Design Award” will be accepted. The selection of the winner by Luxy will be the result of an unquestionable evaluation and it will take into account originality, feasibility and consistency with the brief presented. For the duration of the option right, the Sponsor offers an extra chance to all participants with a royalties contract and an advance on royalties equal to Euro 1,500.00 (one-thousand-five-hundred/00) for the purchase of the license for the economical exploitation of the projects not-acknowledged as the winning proposals. 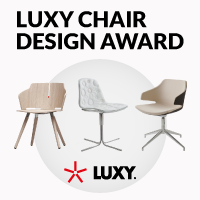 Do you want to stay updated about "Luxy Chair Design Award"?